Besides helping to provide basic water and power requirements to a surging population in Hunterdon and Warren Counties, three reservoirs built within the past thirty years offer tremendous year round recreational opportunities. Fishermen love these huge man-made lakes with a passion, as do campers, birders, boaters and folks out for a good hike. Within twenty miles of one another, Merrill Creek, Spruce Run and Round Valley can satisfy either the most avid outdoorsman looking for trophy fish or the casual daytripper in the market for a nice view. On behalf of the seven power companies who own it, Merrill Creek, the youngest of the three, was built in 1988 on 650 acres of land atop Scotts Mountain in Warren County's Harmony Township. When a drought occurs, water is released into the nearby Delaware River through a 3 1/2 mile underground pipeline in order to enable uninterrupted power generation from stations along the river. On the other hand, in high water times at the Delaware, water is pumped up the mountain into the reservoir. The water in Merrill Creek is as deep as 200 feet. Near Clinton, to the southeast, Spruce Run, built in 1965, is the primary source of water during drought conditions for the Elizabethtown Water Company. Covering 1290 acres, the lake holds 11 billion gallons of water when full and reaches depths of over 75 feet. At times of severe drought, the lake is drawn down by as much as 25%, exposing hunks of land like small mountains in the water, and the flow stops. That's where Round Valley Reservoir comes in! Known to fishermen as the "Valley of the Giants", Round Valley opened in 1972 as a back-up to Spruce Run. It is New Jersey's second largest body of fresh water (next to Lake Hopatcong). 55 billion gallons of pretty, blue water cover 2350 acres, extending to depths of 175 feet. Boaters should be aware of the varying regulations at each reservoir and should always respect the magnitude of these water bodies and the sudden shifts of weather, wind and waves that occur. No boater should venture out without a compass and a whistle in the event of emergency. Merrill Creek can be used during daylight hours by licensed boaters whose conventional boats and canoes are at least 12 feet long. Smaller kayaks and inflatables may be used too, but with extreme caution. The only motors that are allowed at Merrill Creek are electric, so it is battery or arm power only. A boat with a gasoline engine may be on the lake, only with the engines lifted, to be used in the event of severe weather or emergency. Spruce Run offers the only boat rental facility of the three, where you can get a rowboat, canoe, sailboat or motor powered craft for a day. Be it in your own boat or in a rental rig, all standard laws must be fully observed, and no one may use more than a 9.9 horsepower engine. No, not two of them in tandem, only one. The Hunterdon Sailing Club uses this lake for its Regatta's and most of its members try hard to co-exist with other boaters. Round Valley is also used by sailboats, but is best known for its fishing. Power motors are again limited to 9.9 horsepower. Years back several fellows used two and even three such engines at the same time, but the State has stopped this. A 9.9 horsepower engine mounted on a 16 foot boat can traverse the entire lake from one end to the other within ten minutes; so you really don't need a bigger "kicker". Each reservoir supports an ample population of wildlife including deer, foxes and many other local species. And each lake has a large contingent of birds representing dozens of species, so much so that Bird Watcher groups often can be found at each location. Eagles have been seen at each lake. I've seen eagles pick off fish in flight, as you see in Alaskan film, both at Merrill Creek and Round Valley. I once photographed an eagle at Spruce Run within 15 feet of my boat! The State Parks at Round Valley and Spruce Run have swimming beaches, picnic areas and camp sites, some of which are accessible by water only. Neither swimming nor camping is allowed at Merrill Creek. Each lake offers nature lovers many jewels, but most of all, other than fishing, just plain walkin' in beauty seems to be the most popular activity. Surrounding Merrill Creek are more than 2,000 acres of forest and fields prime for exploration for birders and hikers. 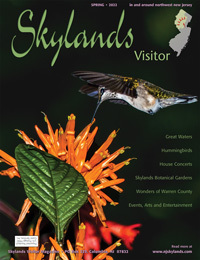 The Visitors Center is a destination in itself, with interactive kiosks, nature displays, historical exhibits, and a regular program of nature walks and workshops presented all year. The Visitor Center is the only building you can see from the water at Merrill Creek, but that's one more than you can find at Round Valley. Here it's nothing but water and trees! Spruce Run has perhaps a half-dozen buildings that you can see around its entire beautiful perimeter. Use of the reservoirs is not quite free for all three all the time, but its not bad! Merrill Creek is free, PERIOD!... daylight hours only, but free to walkers and boaters. Round Valley and Spruce Run may be used 24 hours a day, 365 days a year by licensed anglers and boaters. The boat ramp at Round Valley is free, all the time to such people. "The Valley" charges visitors to its main park a daily fee, as does Spruce Run, through much of the summer, but a single higher fee can be paid to permit unlimited use of both parks as well as many other New Jersey State Parks. Merrill Creek holds a huge population of trout with many of the lake trout having already grown to their legal size limit of 24 inches. Brown and Rainbow trout are here, and they have to be 15 inches long to be a "keeper". Large and small mouth bass swim Merrill Creek as well. Fishermen love these lakes with a passion. And for good reason. Here, Andy Sharo of Dan's Sport Shop holds the mounted State Record 30.2 pound northern pike caught by Herb Hepler. And behind him, two huge brown trout taken in the 70s. All came out of Spruce run. Spruce Run contains at least 18 varieties of fish, and different folks prefer different critters. The two most sought-after are the hybrid bass- a cross of a female striped bass and male southern white bass. The hybrid, which I like to call "Rocket" due to its explosive bite and fight, is my favorite fish to catch. The state record northern pike was caught at Spruce Run, weighing 30.2 pounds, and many like to fish for pike. Huge carp live in Spruce Run, plus trout, perch and other bass. Round Valley is the heaviest fished, having its own club, the "Round Valley Trout Association", more than 1,000 members strong. All five fish that are in Merrill Creek live here as well, but, because they have been here longer, the trout are lots bigger. "The Valley of the Green Giants" is the only lake in New Jersey which has reproducing lake trout, and the state record laker was caught there, weighing 24.85 pounds. The state record brown trout came out of "The Valley" too, 21.38 pounds. A 7.2 pound smallmouth bass was caught back in 1990 and still holds the state record. We have only touched on the law at all three reservoirs, and since laws change, it is important to be up to date. If in doubt, please ask, OK? Enjoy the beauty of our three wonderful reservoirs. Please, please, clean up your litter, and any that someone else might have left too. We may talk further in future editions about these three lakes, so keep your eyes open. Meanwhile, scuze me, gone fishing!